Collectors building custom wine cellars often struggle with a question: “How do I make my wine cellar reflect me?” Wine is your true passion, so you want your wine cellar to be more than just rows and rows of bottles. You want it to reflect your personal style, and say a little something about you and your love of wine. One create way to add that special personal touch to your wine cellar is with artwork. A print, painting or mosaic can speak volumes about you and your taste, helping make your wine cellar unlike any your guests have ever seen before. But where to get started? Here are our top five picks for wine cellar artwork. Have a favorite that we missed? Tell us in the comments! Prints: Modern and edgy, graphic prints can say a lot with just a few words. 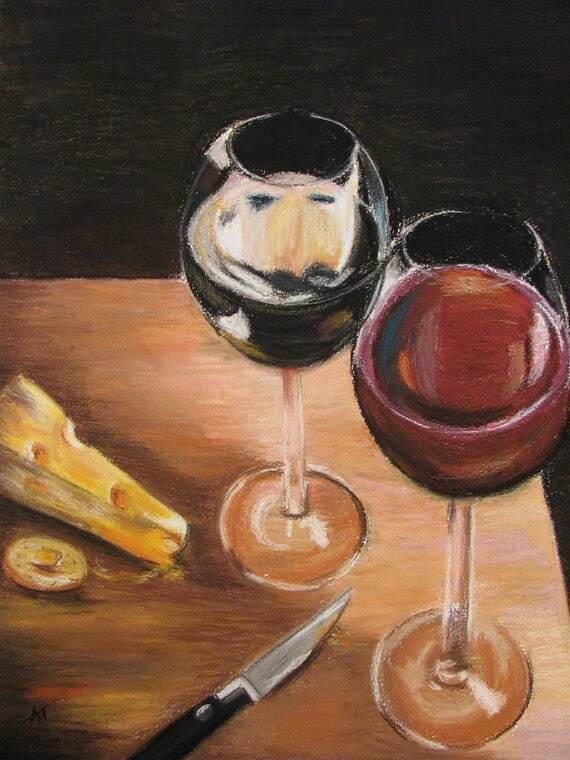 Wine-themed prints are often witty and clever, making them great for the connoisseur with a sense of humor. 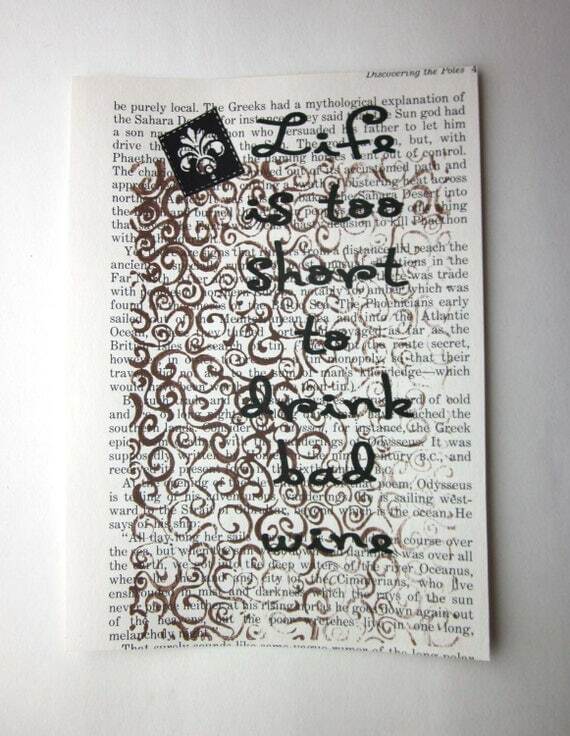 Try this “Life is too short to drink bad wine” print from seller ESPARANTOstudio, or these wine-themed graphic prints, uniquely printed on vintage dictionary pages, from Etsy seller TheSalvagedSparrow. Mosaics: For a piece of artwork that is totally unique, consider a handmade mosaic mural. Mosaics can be made of small bits of glass, fine china, porcelain, or a mix. The mosaic artist composes the pieces into a decorative image, then grouts the pieces and seals the creation. A mosaic can be placed on walls, framed, surround an archway, or cover a tabletop. An artist can create an image unique to you: think your favorite wine region in Spain, or your favorite place to drink a glass in the backyard. Paintings: A wine painting can add a focal point to your wine cellar, and become a conversation-starter between you and your guests. Whether you’re drawn to soft watercolors or a bold, modern style, you can find a wine-themed painting that perfectly suits your taste. Browse these beautiful original pastels from Etsy seller Anna Tooze Fine Art. For something extra-special, look for art that uses reclaimed materials, such as this wine bottle and glass silhouette painting. DIY cork art. Been saving your corks for a rainy day? You can use old corks to create a variety of totally original art pieces that would be fabulous addition to a wine cellar. For inspiration, check out this fabulous wall hanging, this cork monogram, or this wine cellar door completely covered with cork halves. Now that’s a unique piece! Vintage posters. Do you have a thing for all things vintage? A vintage wine ad poster might be the perfect way to put your personal stamp on your collection. Frame one print as a focal point for your cellar, or try a gallery wall that showcases your favorite vintages in style. Check out this Contratto champagne ad, and this Sandeman’s port ad. If you’re thinking about installing a custom wine cellar in your home, you know that you want the space to be functional, but also beautiful. After all, your collection will represent wines from around the world, careful hand-picked by you, and aged to their utmost in the perfect conditions. Shouldn’t you show them off a little? If you’re looking for wine cellar doors that blend seamlessly into the deign aesthetic of your home, classic doors might be the right choice for you. Most classic doors are constructed of a combination of wood and glass, allowing you to peek inside at your collection. The glass can be etched with custom designs to really set your cellar doors apart: think your initials or even a fanciful family crest. And don’t be concerned that the glass-and-wood design isn’t ideal for maintaining the temperature and humidity inside your cellar. Though they are beautiful, these doors were designed with function first: each door is two inches thick, and the glass is constructed of two glass panels, 3/16ths of an inch wide, with an insulating airspace in between. Classic doors are a great choice for a collector looking to put a beautiful, personal touch on his collection. For someone looking to make his cellar doors the showpiece of his cellar design, ornate doors are a great choice. 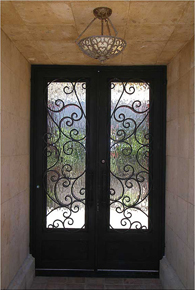 Ornate doors are constructed of sturdy glass panels, just like classic glass wine cellar doors. Then, that glass is decorated with wrought-iron scrollwork. Doors can be made in an arch, soft arch, or square designs. And a variety of customizations in the iron work are available as well, meaning that you can work with a designer to create one-of-a-kind doors that put an unforgettable stamp on your collection. 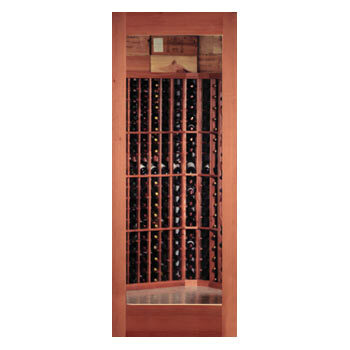 Distinctive ornate cellar doors are a beautiful way to showcase your wine collection. Looking for something so fabulous and unique that it will always be a conversation-starter when you have house guests? Wine barrel doors might be the right choice for you. For wine barrel doors, a mission-style frame is created, and then the spaces are filled with sections of reclaimed wine barrel. Besides reflecting the wine collection that resides behind the doors, this reclaimed wine barrel wood has beautiful, unique characteristics from its years of use. A variety of wine barrel door styles allow you to show off these characteristics in whatever way you choose: cooperage wood is cut to show off authentic stamps and markings from old oak barrels; wine-infused wood is taken from the inside of barrels to show of the deep, rich color it has gained from years of holding wine; and stave wood is careful refinished to keep the natural qualities of each barrel stave intact. For something unique that reflects the natural beauty of wine, wine barrel doors are a great choice. Wine cellar doors are more than just a way to keep your collection at the correct conditions for aging. The right wine cellar doors will not only keep your collection safe and secure, they’ll say something beautiful about you and the collection you’ve so carefully curated. Interested in a custom wine cellar door? Call us today to speak to a wine storage expert about your cellar needs. If you and your significant other have talked about creating your own wine cellar, why wait? 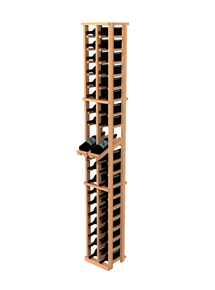 Though Vintage Cellars’ wine racks are designed by experts, they can be assembled by novices in little time. This means, with any of the Vintage Cellars wine racking kits, you’re destined for success! Racks are designed to last a lifetime, and you can select just the right colors to match your decor. Don’t be afraid to get creative! Why, there’s no reason why you couldn’t create a wine labyrinth if you so chose! Wine areas need not be stagnant spaces, either; you can mix and match styles of design to give a single room different atmospheres in different sections. For instance, a formal wall containing Winemaker 2 Column Open Diamond Cubes can be contrasted by an opposing lighter, playful wall featuring black metal lattice wine racks. An elegant diamond bin wine rack below a classic archway can be countered by a section of modern wine racking units, like the VintageView 3′ wine racks, and so on. You can even use different designs to house different wines: dark, rustic ones for reds, and lighter ones for whites! 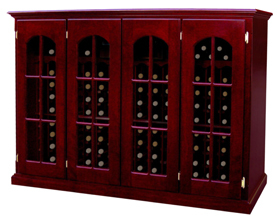 With so many types of wine racks to choose from, you’re limited only by your imagination. If the above projects seem too ambitious, here’s an easy-yet-creative idea that is sure to attract attention: spell out a marriage proposal, or make an announcement with wine bottles. If the bottles are racked, you can easily spell words and messages by placing red wines, strategically, amidst a “neutral” backdrop of whites. You can even create simple images, similar to popular ASCII art we sometimes see on our friends’ Facebook posts. Because this takes a little time and planning, your message will be all the more memorable (However, if your partner is one of the many wine lovers who organizes their collection obsessively, think twice before moving their collection around. And keep in mind that unnecessary movement isn’t a great thing for stored bottles–this plan might be best executed with some of the less-collectible bottles in the cellar!). Have fun getting those creative juices flowing! Meet Our New Custom Cellar Design Request Form! Have you always dreamed of having your own wine cellar? Or, if you’re new to collecting, is your cabinet filling up faster than you expected? It might be time to look into building a custom wine cellar—and Vintage Cellars is the exact right place to come. Use the new Custom Cellar Design Request form, easily accessible from our Custom Wine Cellar Design page, to tell us all about your dream wine cellar. You’ll need to have an idea about the size of your collection, your desired cooling system, and your budget, as well as the intended location of your wine cellar. Once we have all of your information, we will contact you about your cellar design. We will do our best to meet your budget needs and timeline by incorporating our racking kit styles into your design. 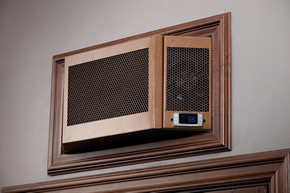 And get ready to discuss the luxury custom wine cellar you’ve been wishing for!